Because innovation doesn’t have to be about moving fast and breaking things; it can also be about achieving what you believe in. Technology has introduced us to new knowledge, wonder and ingenuity. It has made our lives easier, faster and more fun. But at the same time, many of the social harms of digital technologies built with a move fast and break things ethos — from its impact on social interactions to the results of national elections and large scale hacks — are now becoming apparent. As is the need to address them. Why do tech teams need new ways of working? These social harms have caused immense reputational damage and resulted in a growing lack of trust between the public and technology. Doteveryone’s landmark research into the public’s attitudes towards technology, for example, finds that only 12% of Brits think that technology has had a very positive impact on society. This hinders innovation and growth. But there are a lot of exciting opportunities to do better. Doteveryone has spent the past year researching the issues organisations face when trying to embed responsible technology practices in practical and tangible ways. What we found were that there are gaps within development cycles and processes for catching problems a technology product or service may cause once out in the real world. Whilst using Agile approaches to developing software has been a great opportunity to allow organisations to ship technology products or services and then iterate quickly if something goes wrong, it’s currently missing two essential components. The first is that Agile practices focus more on the building of a product and, other than users’ interactions with the product, don’t tend to look at how it will act once out in the world. There is no clear or formal point once a project has gotten started to take careful consideration and quickly raise the obvious (and some not-so-immediately obvious) consequences — whether positive or negative — a feature could have and solve for them proactively rather than reactively. The second gap within Agile is that today, technology is largely only designed for individuals as consumers. It does not question what consequences there may be for a feature or a product once at a mass scale. This is where many of the problems we see happening now lie. Organisations should be learning from the unintended consequences of technologies we are seeing playing out today. They should also be seeking new business processes and new mindsets to accompany the making of new technology products and services in order to reduce future social harms and create better products for everyone. This is why Doteveryone has started a new programme called TechTransformed, which will work with technology organisations and communities of practice to adopt new approaches and practices to consider the context, potential consequences and contributions of technology products or services as they are built. We have developed a new Agile event that fits into an iterative development cadence that allows organisations to reflect on the impact and consider the potential consequences of what is being built — early and often. The event or ceremony, which calls for both multi-disciplinary and cross-functional collaboration, will lead to product decisions with a focus on the positive aspects of a product and the opportunity to mitigate or address potential harms or disasters. What are the intended and unintended consequences? What are the positive aspects we want to focus on? What are the not-so-positive aspects we want to mitigate? 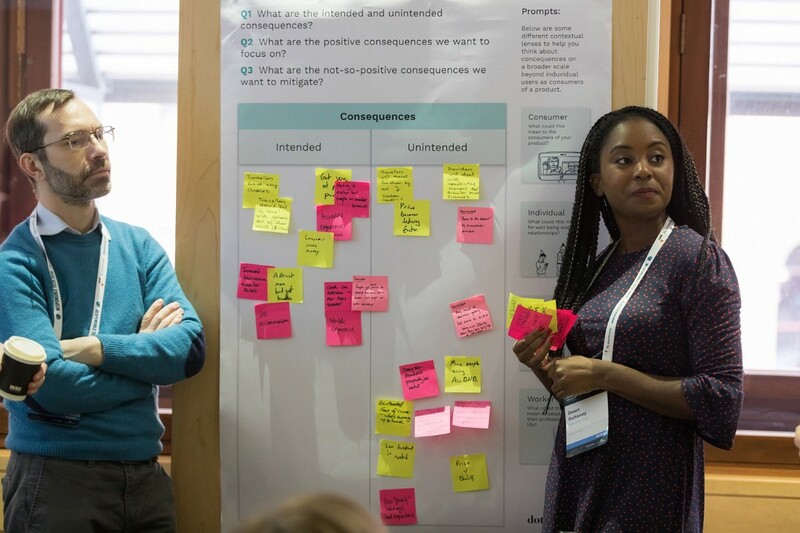 We premiered this Agile event at Responsible Tech 2019: The New Normal on Thursday 31 January 2019 by running it as a one-hour workshop for a group of the day’s delegates. 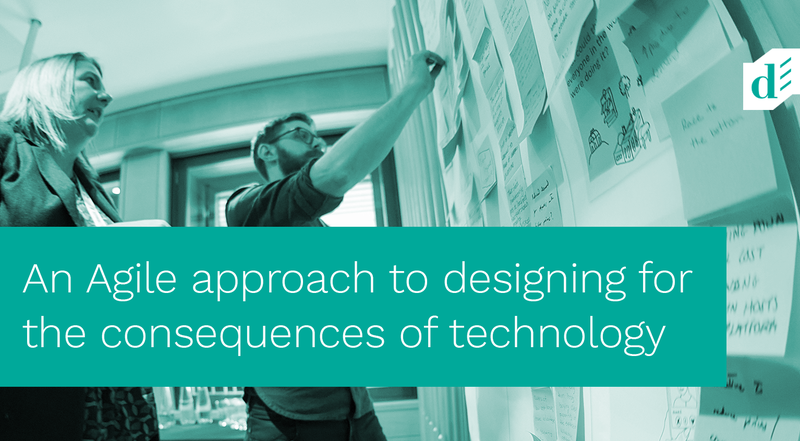 We’d like to see widespread adoption of this approach by the end of the year so that as many teams as possible are developing technology with their responsibility to consider the consequences at the heart of their business planning, design thinking and product management. Look out for more details and attributes about this new Agile event and a corresponding canvas for the product roadmap and strategy level as we will be developing a kit to share very soon! Doteveryone is an independent think tank that explores how technology is changing society, shows what responsible technology can look like, and builds communities to improve the way technology shapes our world. We want industry to build technology that considers its impact on society, we want the public to have a greater voice in shaping technologies and we want policymakers to make informed and responsible decisions about the ways we use technology. Doteveryone has created TechTransformed — new methods and resources that will transform how technology teams create products and services.